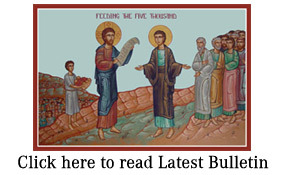 Parish Council meeting follows today’s Divine Liturgy for the first Sunday of the Great Fast. During the social time in St. Mary’s Hall it will be announced when we’re about to start the meeting. The 2nd All Souls Saturday is being celebrated following the Presanctified Liturgy on Friday, February 22 at 7 p.m. Please attend both services this Friday and stay for a dinner and either a Lenten video or talk. 1) Pray – talk to God. He will listen and respond. Say prayers from your heart as well as a prayer book. “A Prayer Journey through the Great Lenten Fast and Great and Holy Week” is available in the hall. Please use your copy each day during the Great Fast for your private prayer. 2) Go to Church – not only on Sundays but to Presanctified Liturgies and All Souls Saturday services. 3) Repentance – repair your relationship with God. Accept that you can do better then strive to do so. 5) Read – the Bible and other spiritual books. We have a wealth of good books for you to purchase. 6) Alms – give to those in need. Ask yourself if you’re giving of your time, talent and treasure to those in our community for the glory of God.